What’s the best thing about living in this snowy wilderness? I find it very peaceful and calming. What do you enjoy most about teaching guests how to ski in such a lovely setting? I enjoy it when people can connect to this peace and enjoy learning and being in this wonderful setting. No, I have lived in many places around the world. Venabu is really close to my heart – maybe the last 12 seasons I had here describes this connection. What tips would you give to beginner cross-country skiers? Less thinking , more feeling. What equipment/clothing do guests need to bring with them? Layering is important – good warm hat, warm mittens/gloves, warm socks (woollen maybe), thermal leggings and top, trousers and a jacket, maybe a buff for really cold days. We should all remember it is an outdoor experience – we will see what works for each individual. Bring more kit as a base. What do you do when the peak winter season is over? I work as a mountain guide/leader for the summer months as well. What would you say to people considering visiting Venabu to persuade them? See it for yourself – it is a wonderful place. Why do you think your guests love the region so much? It is a beautiful setup – perfect for all levels. The trails are so easy around the hotel and the more experienced you are the more areas you can discover further out. What is your favourite ‘not to be missed’ activity except cross-country skiing? Describe your perfect day in Venabu. Having a full day with a group of really enthusiastic beginners on their first day of cross-country skiing. 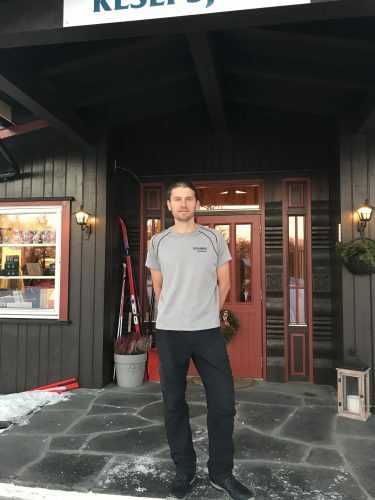 Robert works for the Venabu Fjellhotel and guides Headwater customers on the Cross-Country Skiing at Venabu trip.